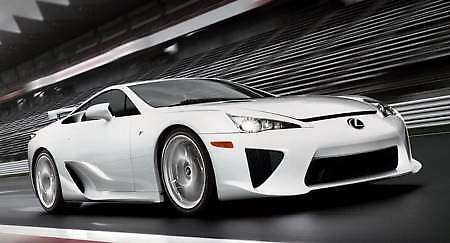 552hp Lexus LFA launched: full details! 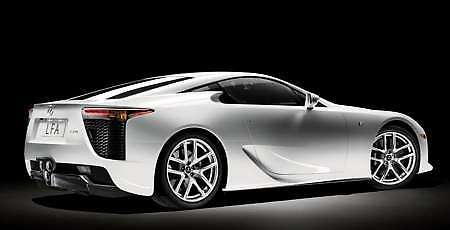 Home » Special Coverage » 2009 Tokyo Motorshow » 552hp Lexus LFA launched: full details! We all know that this year’s Tokyo Motor Show will mostly feature Japanese models apart from cars by just three European manufacturers. Nevertheless, the show that kicks off this week will have at least two major highlights including the Toyota FT-86 Concept and an all new supercar by Lexus. Yes as the title suggests we are talking about the V10 LFA. The 2-seater LFA is motivated by a mid-front mounted 1LR-GSE 4.8 litre DOHC V10 that cranks out 552hp at 8,700 rpm and 480Nm of torque that is achieved at 6,800 rpm (90% of which is available from 3,700 rpm). The engine that screams at a red line of 9,000 revs features Dual VVT-i technology, equal length exhaust manifolds and high-volume, a total of 40 valves, 12-hole fuel injectors, 12:1 compression ratio and is Euro 5 compliant. 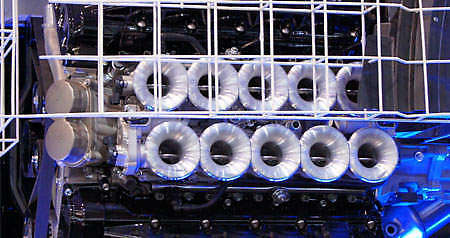 The powerplant was co-developed with Yamaha and features a total of ten individual throttle bodies – one for each cylinder! Titanium valves, ultra–light weight rocker arms with a diamond–like coating and a fully integrated lower crankcase reduces pumping losses at high RPMs. Mated to a rear-mounted 6-speed Automated Sequential Gearbox (operated by steering-mounted paddle shifters) that drives the rear wheels via a limited slip differential, the engine enables the supercar to hit 100 km/h in just 3.7 seconds and reach a top speed of 325 km/h. The drivetrain has four driving modes that is made up by Auto, Sport, Normal and Wet modes. Each mode has a specific gearshift program as well as engine and brake control logic systems to let the driver tailor the car’s performance to suit different driving conditions. Stopping power is provided by carbon ceramic 390 mm front discs and 306 mm rear discs. The front setup has 6-piston aluminium calipers while the rear features 4 pistons. The LFA has a track-tuned suspension that according to Lexus, gives “the best possible balance between control and comfort”. It has a bespoke front wishbone and rear multilink design configuration that is mostly made of aluminium alloy. It also has aluminium monotube dampers that were also featured in the LFA race car that took part in the Nurburgring 24-hour event. The rack and pinion setup in the LFA features an Electric Power Steering System. The 1,480kg car sits on 20-inch aluminium BBS wheels that are shod with Bridgestone-sourced 265/35ZR20 tires for the front and 305/20ZR20 tires for the rear. Along with a drag coefficient of 0.31, it has a carbon fibre rear diffuser and flat underbody that help generate significant downforce. There is also an active rear wing. The hand-built interior is treated to seats upholstered in fine leather and Alcantara. The trim details are finished in brushed metal while the floor-hinged brake and throttle pedals are made of forged aluminium. The hooded instrument panel combines an LCD display panel with a colour Thin Film Transistor (TFT) and a motor-drive movable ring. It features a single circular dial with a central tachometer with an LCD needle. When engine speed exceeds 9,000 rpm, the display area turns red to prime the driver for an up-shift. It can also be programmed to turn yellow or green when the revs reach a user-selected range. The dial also houses a digital speedometer and gear indicator, transmission mode, vehicle control data and trip information displays. At 4,505mm by 1,895mm by 1,220mm with a 2,605mm wheelbase, the car is slightly smaller than a Ferrari 458 Italia. Production will be limited to 500 units and pricing in the US starts from approximately US$375,000. Lexus revealed that the LFA will be hand-assembled at the Motomachi plant in Toyota City and each V10 engine will be assembled by a single engineer. Continue reading to view an image gallery.